*Note: after you read the review, please scroll down to the end of this post and answer the question I've asked. Thank you, beloved readers. I've followed Kathy Cano-Murillo for quite some time on her crafting blog and lately her writing blog. Why? Because she is a person who knows herself through and through and puts that self on the page (and the canvas) over and over again, without fear of what others think. Here's my test of a good book: whether or not it passes the Lunchtime Reading test. Since I work alone, and at home, I eat lunch in my kitchen, and there's always a stack of magazines in there that I'm trying to catch up on–O, The Food Network magazine (love that thing, even though I hate cooking), People, Outside, Poets and Writers, Shambala Sun. I love buying magazines and lunchtime is when I read them. If I have a really great book, I shun the magazines and read my book instead. But it takes a lot to drag me away from my magazines. 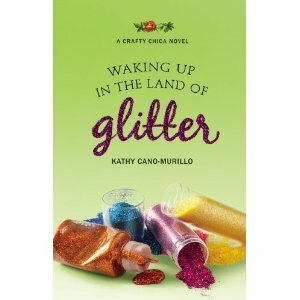 Waking Up in the Land of Glitter is a sweet, fun book that I gobbled up in a couple lunch-time readings. And a few nights lying in bed. It takes place in Phoenix, and is the story of Star Esteban, a young woman who is a bit, how shall we say this, ditzy. She works at her family's restaurant, which sounds like the most fabulous place on earth, a cafe that sells amazing Mexican food and Margaritas, plus an art and event space, but she really longs to be an artist. Because she is, um, scatter-brained and undisciplined, she never fully commits to her art. Up until now. Along the same lines, she never fully commits to the man who loves her, Theo Duarte, until early on he gets sick of her shenanigans and ditches her. Then things get worse. Because of an act of vandalism Star commits on a drunken evening (it sounds worse than it is) her family tells her she can no longer work at the restaurant and has to make her way on her own. So now she is job-less and boyfriend-less. And then the glitter shows up. Over three hundred pounds of it, ordered by mistake (she thought she was ordering 3 pounds). And somehow she has to find a way to use it and pay for it before her family finds out. Like I said, its a fun read. And honestly, who would have thought you could create a plot for a novel around glitter? Only Kathy Cano-Murillo. I had a few quibbles with the writing here and there (I'm a writer, I'm highly critical), particularly the author's habit of dropping in huge chunks of narrative backstory. But the charm and verve of the story more than made up for that. So if you are looking for a novel to pass your own version of the Lunchtime Reading test, give Glitter a try. *And now for the above mentioned question: a couple weeks ago I wrote a blog post asking readers for reccomendations on books. Would you like me to compile this list in a post before I leave for Nashville this week? Bonus question (I just thought of this one): What is your version of the Lunchtime Reading test?